On April 21–22, a quintessential White Cube will be inaugurated on a former Unilever plantation in Lusanga, 650 km southeast of Kinshasa, D.R. Congo. Designed by OMA, this White Cube is a central element of the Lusanga International Research Centre for Art and Economic Inequality (LIRCAEI). 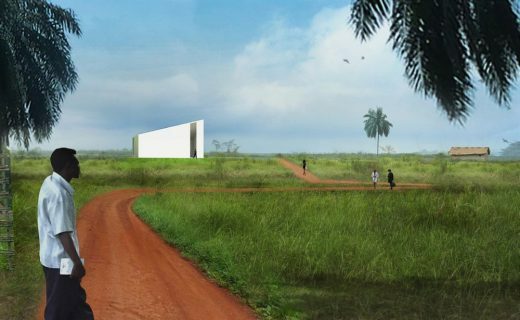 On April 21–22, a quintessential White Cube will be inaugurated on a former Unilever plantation in Lusanga, 650 km southeast of Kinshasa, D.R. Congo. Designed by OMA, this White Cube is a central element of the Lusanga International Research Centre for Art and Economic Inequality (LIRCAEI). Located in the heart of the plantation system and at the crossroads of global inequality and climatological change, the research center aims to become a vector for a social and ecological shift. LIRCAEI is a joint initiative of the plantation workers’ cooperative Cercle d’art des travailleurs de plantation congolaise (CATPC) and the Institute for Human Activities (IHA). The festive and solemn inauguration of the White Cube will mark the launch of the five-year research program of LIRCAEI. In Lusanga, the White Cube will attract both the capital and the visibility needed for plantations workers to buy back land and develop a new economic and ecological model on-site: the post-plantation. With the establishment of LIRCAEI, the iconic modernist White Cube will be recontextualized in the setting that has historically underwritten its development. In economic terms, plantations have funded not just the building of most European and American infrastructure and industries, but also that of museums and universities. On an ideological level, the violence and brutality unfolding on one side—the plantation zones—has informed and haunted the civility, taste and aesthetics championed at the other: the White Cubes. By colliding these two opposite poles of global value chains with each other, LIRCAEI aims to overcome both the monoculture of the plantation system—that exhausts people and the environment and the sterility of the White Cube—a free haven for critique, love, and singularity, that, more often than not, reaffirms class divides. To mark the opening of the new research program centered on the definition and implementation of the post-plantation, CATPC is curating an exhibition on the interconnectedness of art, ecology and the economy. CATPC’s newest works will be unveiled alongside contributions by other prominent Congolese and international artists. The exhibition will serve to activate the White Cube and put it in the service of Lusanga’s people. The opening weekend will also feature a concert, public discussions, a film program and a ceremony celebrating the repatriation of the White Cube. The recently published monograph dedicated to CATPC’s work, edited by Sternberg Press, will also be presented during that weekend. The White Cube will include an internet platform that connects its research to plantations and museums worldwide. Plugged into these international networks, the White Cube will transform the former palm oil plantation of Lusanga into a legitimization machine, investigating and relaying the strategies of resistance alongside visions for the future of plantation workers globally. Within five years, LIRCAEI seeks to have designed the blueprint for a new economic model in which art serves as an engine to start inclusive and ecological post-plantations throughout the Congo. Participating artists include: Sammy Baloji, Djo Bismar, Marlene Dumas, Michel Ekeba, Eleonore Hellio, Carsten Höller, Irene Kanga, Mathieu Kasiama, Jean Katambayi, Jean Kawata, Mananga Kibuila, Huguette Kilembi, Mbuku Kimpala, Mao Kingunza, Thomas Leba, Jeremie Mabiala, Blaise Mandefu, Daniel Manenga, Mega Mingiedi, Emery Mohamba, Daniel Mvuzi, Cedrick Tamasala and Luc Tuymans. CATPC is published by Sternberg Press and includes texts by Ariella Azoulay, Eva Barois De Caevel, Eléonore Hellio, Ruba Katrib, Alexander Koch, J. A. Koster, Renzo Martens, René Ngongo, Els Roelandt, Charles Sikitele Gize, Charles Tumba and Françoise Vergès, and photos by Léonard Pongo. OMA is responsible for designing the master plan for the Lusanga International Research Centre for Art and Economic Inequality, including the White Cube. The project is overseen by their managing partner architect David Gianotten. The executive architect is Arsene Ijambo, general secretary of the Association of the Architects of the Congo (SAC). The opening weekend of LIRCAEI is organized by IHA and CATPC, in partnership with OMA, the Ministry of Arts and Culture of the Democratic Republic of the Congo and KASK – Ghent School of the Arts. The opening weekend of LIRCAEI is also supported by the Gieskes Strijbis Fund, the Mondriaan Fund, Bralima, Stichting Educatie en Cultuur and the Prince Claus Fund. The resurgent conflict concentrated in the eastern part of the Democratic Republic of Congo (DRC), widely covered in recent press, is something volunteer Barbara Paagman had the misfortune to personally experience on her recent site visit to the built environment charity Article 25’s schools project in South Kivu. A severely under developed country, the DRC has been ravaged by war and lacks infrastructure. Women face high levels of gender-based violence and young men are co-opted by rebel groups that spread conflict and insecurity across the nation.